China seems worried the US is trying to contain it in Southeast Asia. Even if it were, there are many reasons why it couldn’t. The live-fire drills conducted by Vietnam in the South China Sea last week further raised tensions with China, which interpreted them as a show of force aimed at defying Beijing. The Sino-Vietnamese flair-up was followed by an official statement from Philippine President Benigno Aquino, who welcomed help from his country’s long-time ally, the United States. This view was echoed by Vietnam, which urged international involvement in the dispute. Chinese statements, in contrast, made clear that other countries should refrain from getting involved so that the parties in the dispute can reach a resolution through bilateral consultations. China has been a consistent opponent of any efforts to internationalize the issue, resisting any multilateral solution. This attitude was highlighted by the strong Chinese objections to US Secretary of State Hillary Clinton’s statement in Hanoi last July, when she suggested that the United States could mediate in the dispute. China’s main concern is that the United States is pursuing a containment strategy against it. However, even if there were any truth to these suggestions, the South East Asian strategic environment is extremely complex and doesn’t lend itself particularly well to conventional containment strategies. For a start, China is one of, if not the most important, regional actors in economic terms. Chinese influence was already entrenched by the 1990s, but was consolidated during the Asian financial crisis of 1997-1998. Since then, Chinese influence has grown through a Free Trade Agreement between China and the Association of Southeast Asian Nations, which came fully into effect at the start of this year. For the majority of ASEAN member states, China is one of the top five trade partners. For China, meanwhile, the ASEAN bloc is its fourth-biggest trade partner. In contrast, the United States’ focus is on being the guarantor of regional stability, and it has a vested interest in ensuring the stability of the region. US Defence Secretary Robert Gates, in his address to the Shangri-La Dialogue in Singapore earlier this month, reiterated the US national interest in ‘freedom of navigation, open access to Asia's maritime commons and respect for international law in the South China Sea.’ Yet with one-third of the world’s seaborne commerce travelling through the region, US concerns over potential disruption to so-called Sea Lanes of Communications shouldn’t be misinterpreted as containment. More importantly, though, the biggest barrier to any US effort to contain China is the highly ambivalent position of the Southeast Asian countries vis à vis the US presence in the region. For instance, in the case of the South China Sea dispute, US involvement as suggested by Clinton last year was opposed not only by China, but by a number of Southeast Asian countries. Then-Philippines’ Foreign Secretary Alberto Romulo, for example, argued that negotiations should take place strictly between ASEAN and China. It seems that despite the risks of negotiating directly with a powerful China, the alternative of inviting the US to talks wasn’t seen as preferable. The last thing ASEAN countries would like, it seems, is to become trapped in a Cold War-style situation under which they have to choose between two world powers. And although the mood appears to have shifted somewhat in recent months, there’s still noticeable ambivalence over a greater US role, due mainly to a cocktail of cost/benefit calculations mixed with lingering historical issues and concerns. The South China Sea row underscores the likely problem that any US containment policy would face in Southeast Asia. The politics of the region are simply too complicated, and China is too entrenched economically, to make it a viable approach. With this in mind, is it likely the US really is investing the intellectual energy and resources into pursuing such a strategy? Eleni Ekmektsioglou is a Handa Fellow at Pacific Forum CSIS. She holds a Masters degree from the King's College London War Studies Department. 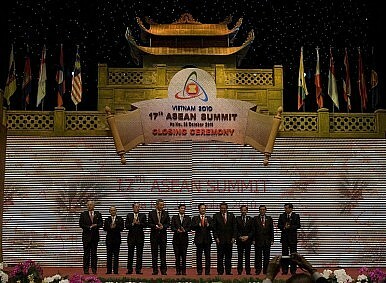 The guidelines agreed at the ASEAN Regional Forum are a good start in resolving the territorial row between China and Southeast Asian nations.